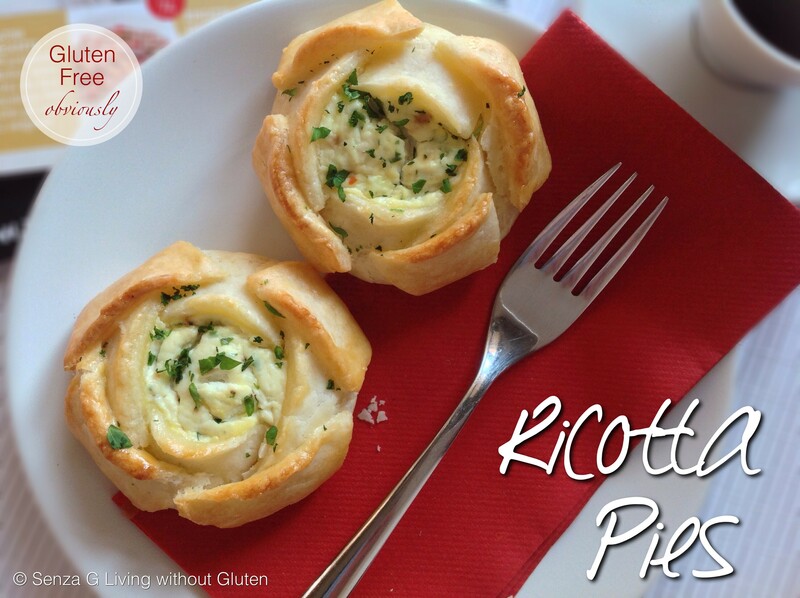 Home \ CeliacCorner Posts/Blogs \ CeliacCorner Blogs \ Recipe: Gluten-Free Qassatat, a Maltese Favorite, by Jacqui Farrugia, our Featured Food Blogger! Jacqui was born and raised in Malta, and currently resides in Bergamo, Italy, in the Lombardia region. As evidenced in her recipe below, she is a food artiste and we are excited to share with you her recipe for Qassatat with Spinach & Anchovy filling, a traditional Maltese “street” food (with optional recipes for Ricotta & Pea fillings included). Hi, I’m Jacqui and I have Celiac. I always had a passion for food but my enthusiasm came to a sudden halt when I was diagnosed with CD and believed I would never enjoy food and cooking like I used to. How wrong I was! I started exploring recipes and new ingredients that would allow me to keep my hobby and enjoy the taste of food and good company. With support, research, patience and a desire to learn, living the gluten free lifestyle has become less daunting, yet definitely challenging! 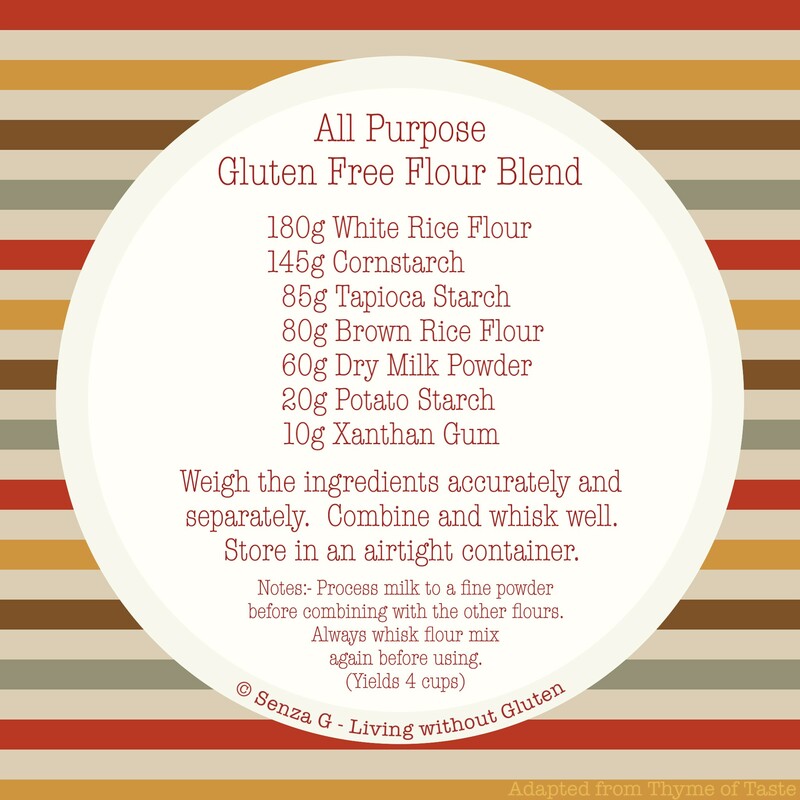 I created “Senza G – Living Without Gluten”, with the intention of helping others diagnosed with Celiac and Gluten Sensitivity. I share my recipes, experiences, tips and ideas on how to turn food from being boring to adventurous and daring … and obviously gluten-free! In Malta we have these lovely pastries called Qassatat, (plural, single would be Qassata) with a silent Q, and pronounced AS-SA-TAT, which are a Maltese street food, found in these little shops scattered all over the island. They are very popular and they appear in these shops early in the morning together with another type of pastry called Pastizzi and these are sold throughout the whole day. They are like open-topped shortcrust pastries and come with three fillings, Ricotta, Peas and Spinach & Anchovy. They look like little money bags ‘pleated’ at the top. That is the traditional way. You have to have a knack for getting them so perfect! When I was a kid, mum used to make these in mini form every Saturday evening without fail. Her pastry was so good. I used to love them cold the next day! Well that was before I was diagnosed with Celiac. I missed these pies and so wanted to try them out. And I have made, with great success, shortcrust pastry for Qassatat and savory pies! The secrets to this delicious pastry are two. The first is that items have to be freezing cold and the second … wait for it … Vodka! The simple explanation for Vodka is that it gives the dough, the liquid a dough needs to come together but being mostly alcohol, evaporates in the oven, leaving you with a flaky dough. So do not be afraid to use it. Apart from the fact that you are using a small amount, there will also be no taste since it evaporates. It is a really melt-in-your mouth pastry! I used to use shop bought (all-purpose) GF flour mixes, which you can still use for this recipe. But I have found that if you mix your own, (see my favorite mix below) in the long run it will be more cost effective and the taste is even better. Put the measured flour with the baking powder in a bag, the water and the butter in the freezer for about 2 hours. Cut the butter in small cubes BEFORE as otherwise it would be too difficult to cut the butter once frozen. Take the items out of the freezer, place the flour mix and the butter pieces in a food processor and mix until it looks like coarse crumbs. Start adding the Vodka followed by the icy water till it starts coming together. Be flexible with the ratios, some times it needs less liquid. Tip the dough in a plastic bag and knead it briefly through the plastic and then place in the fridge for another two hours before using. With this flour mix, I found that I do not have to use any paper when rolling out the dough. It is soft and pliable and does not stick. Use this dough for any of your savory pies, Qassatat or quiche bases. It behaves perfectly! 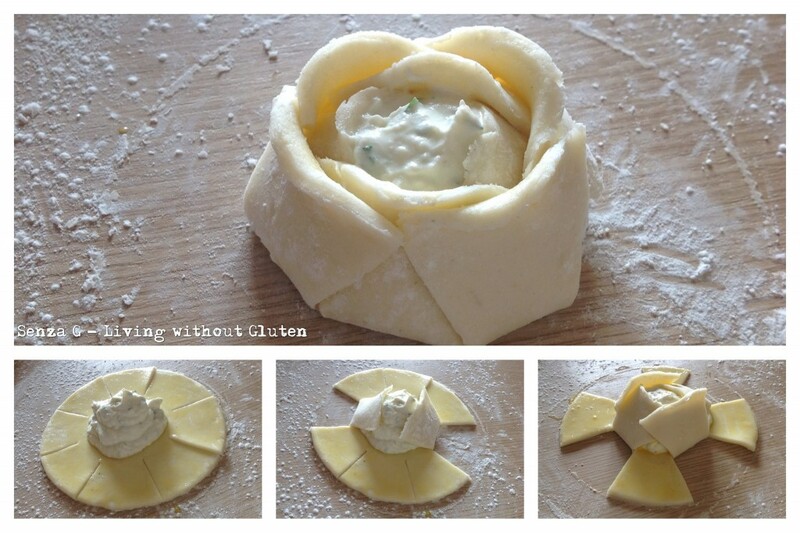 Whilst the dough is chilling, you can prepare the filling. I made a Spinach and Anchovy Filling, (the Ricotta Filling and Pea Filling recipes are also included below should you want to try them!). In a pan, fry the onion until translucent. Then add the garlic and anchovies, breaking them up as you cook. Add also the spinach and peas and cook until tender. Throw in the tuna, the chopped olives and capers and mix well. Season. Take off the heat and leave to cool before using. On a floured surface, roll out the dough and cut rounds of dough around 4 to 5 inches in diameter. Glaze the inside with beaten eggs. Place a spoonful of filling in the center and gather the dough up towards the center making pleats as you go along to make into our traditional Qassatat, or else follow my steps below and shape like roses. Glaze with egg wash and bake in a 160 degree oven until golden brown. You may need to cover them with foil so the tops will not burn, until all the pastry is cooked. Note: Our Maltese Ricotta looks more like Cottage Cheese whilst many other types of Ricotta you find on the market might be more creamy. Therefore you might need just one egg. Please use your judgement. 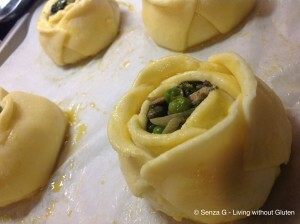 The filling should not be too liquidy or it will ooze out of the dough. Place all the ingredients together in a bowl and combine well. Options: You can add some boiled spinach to the Ricotta mix if you like. Another idea would be to add some finely chopped prosciutto and some boiled peas to the ricotta mix. When in season, we sometimes add baby broad beans. Wash the peas and place in a bowl, cover with plenty of water and set aside to soak for at least 5 hours. Heat a tbsp of olive oil in a pan, add the onion, and garlic and sauté until golden. Stir in the curry powder. Add the mushy peas, combine and season with salt and black pepper. Remove from heat and leave to cool. * This is the traditional way of making the pizelli filling, however, you can cheat, and skip this process by either using canned mushy peas or frozen peas, the latter cooked till mushy. For more delicious, gluten-free recipes, follow Jacqui via her website (click left) and on Facebook and Pinterest too! 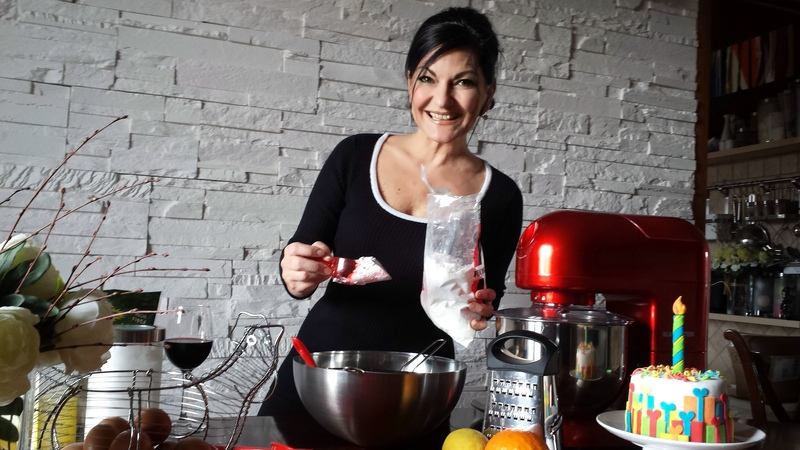 We are excited to share that Jacqui will be featured in The Times of Malta’s Supplement: Eating and Drinking Magazine, published on Friday, April 11th, and also her recipes for gluten-free Figolli and Bunny Cake will be featured in their Sunday Times Easter Supplement published on April 14th, just in time for Easter! Attention talented food bloggers, contact CeliacCorner if you would like to be considered as a future Featured Food Blogger, send your request to: info at CeliacCorner dot com (note: not all bloggers/recipes submitted will become a “Feature”). 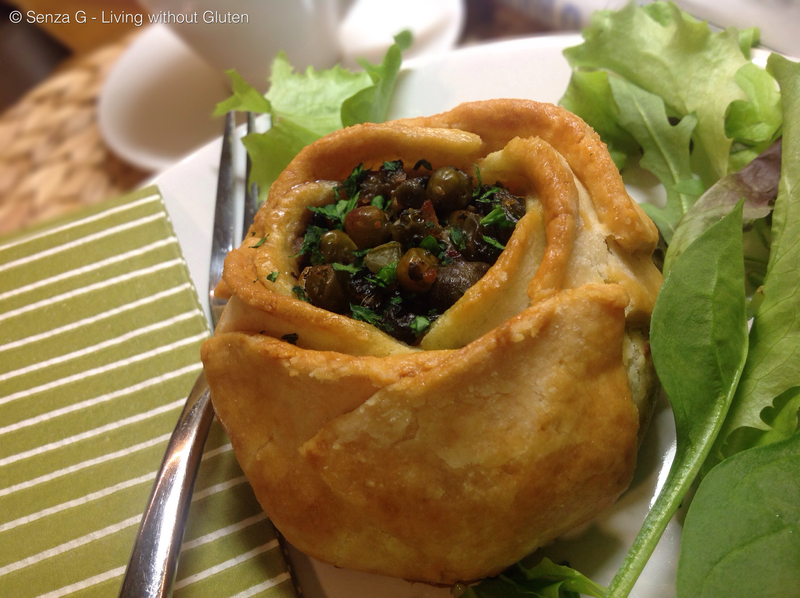 10 Responses to Recipe: Gluten-Free Qassatat, a Maltese Favorite, by Jacqui Farrugia, our Featured Food Blogger! Comment *Thank you very much that sound delicious. Comment * Can’t wait to try this recipe….it looks so appetizing and healthy! Love anchovies. Thank you Jacqui F.
Vice nice recipe, thank you for posting. I’m not a fan of anchovies, so thanks for adding the recipes for the other fillings. I’ll try the ricotta. Comment * Hi Jacqui well done! I’m going to try these! Thank you for introducing me to Jacqui Farrugia. I recently self diagnosed myself with a gluten sensitivity and have been trying out some new recipes. I am looking forward to trying this.Great feature!! !